« Do people still believe that the “wages of sin” deserves death? In his masterful theological commentary on Matthew, Frederick Dale Bruner reflects on infant baptism, as part of his discussion of Jesus’ baptism by John in Matthew 3:13-17 (my text for this Sunday). As a Presbyterian, he, like me and my fellow Methodists, is part of a tradition that practices infant baptism. And like me, he was “converted” to the practice later in life: he didn’t grow up believing in it. To Bruner’s credit, he gives good arguments on both sides and admits that he is “of two minds” on the subject. Truthfully, I am as well. But it’s not as if I’m more evangelical or evangelistic than my Reformation ancestors Luther, Calvin, Cranmer, and Wesley; I’m not more of a champion of “justification by faith alone” than they were. Yet each of them still believed in infant baptism. (It was those darn Anabaptists who were the weirdos!) For that reason alone, I’m willing to set aside my doubts and accept the consensual teaching of the universal church, which—as far as we can tell—practiced infant baptism (without controversy) from nearly the beginning. For those of us who practice infant baptism, however, let’s face facts: It often seems to make no difference in the lives of people who were so baptized. There’s often little evidence of conversion in the person’s life, aside from the most nominal kind of faith. And plenty of people who were baptized as infants later reject the faith. What do we make of this? Where faith is not sustained in the hearts of baptized children, the gifts really given by God in baptism are left unused in an unopened section of the human heart. The gifts can even be rejected, and apparently they are by most (see the important discussion of this sad fact of “most” in 1 Cor 10). And then there is only judgment, as John’s Fire Sermon makes clear—and makes clear to believers. But when the faith given in baptism is maintained and confirmed, when baptized persons turn to Christ in fresh decisions of faith, they find that Christ has always turned earlier to them, as early as their baptism. The earliest delivery of the passion in our own lives occurs ordinarily in baptism. And for all we know (and Luther liked this view…; cf. Calvin’s only slightly different understanding…) a divinely given infant faith can receive the gifts given then and there in baptism. (Therefore infant baptism can be believer baptism.) No one should laugh (Gen 17-18). “Is anything too hard for the Lord?” (Gen 18:14 RSV). Then the weekly invitations to re-receive the gifts previously given to the people of God at baptism happens again and again in the preached Word and Supper with their fresh gospel messages of faith and repentance. Bruner’s view, please note, is more congruent with the Wesleyan tradition, which doesn’t hold to eternal security; which believes that backsliding is possible. Thoughts? Are Bruner’s words persuasive? 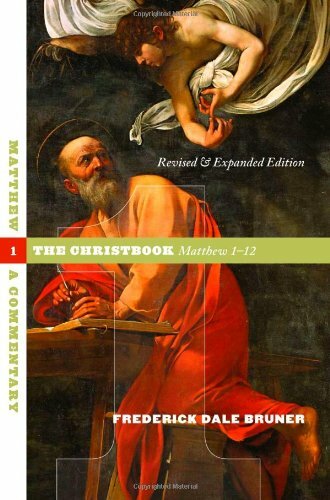 † Frederick Dale Bruner, The Christbook: Matthew 1-12 (Grand Rapids, MI: Eerdmans, 2004), 112-3. This entry was posted on	January 14, 2017 at 12:33 am	and is filed under Uncategorized. Infant baptism is somewhat like the Jewish rite of circumcision on the 8th day. It marks the child and commits the parents. That God, The Holy Spirit, is also at work in the child in its baptism is a matter of faith, with which I agree. However, I think that adult baptism, even if it’s “re-baptism” of one baptized as a child, is an important and commendable ritual. To have the covenant confirmed by the consenting adult can only be pleasing to God. I myself was only baptized once, as a 13 year old Methodist youth. This was not the result of any plan by my parents, or any church custom. It was just the way it happened for me.